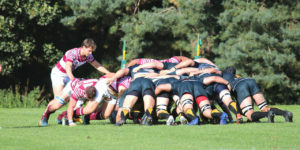 From try time to dinner time, sidelines to side dishes the holidays are fast approaching, and many rugby players across the country find themselves on the business end of a steak knife while training and nutrition take a backseat. During the winter months, there’s a real risk that some of us will gain weight and suffer diminished fitness levels. For others, it could be a season of weight loss and personal bests. For some players, a few extra lbs going into the season can assist with injury prevention. But that doesn’t make them any more welcome during pre-season conditioning sessions. Whether it is weight gain or weight loss, the personal fitness of an athlete during the holidays will vary depending on the goals you set and how hard you work to accomplish those goals. This article doesn’t preach the necessities of weight gain or weight loss during the winter. That’s going to be unique to each. But what it will detail is how to maintain a balance between health and fitness this off season. 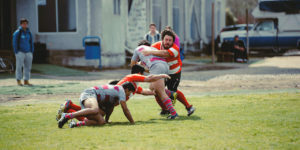 As the fall rugby season winds down, many amateur rugby players are looking forward to a vacation where they can relax and enjoy time with family and friends. Rest, relaxation, and recovery is vital for an athlete allowing the body to heal and repair itself ensuring that you have a solid foundation for growth and improvement when spring rugby starts again. Towards the end of the fall season, athletes should have a general idea of what they want to achieve during the holidays, and where they want to be in regards to health and fitness. The best way to achieve your desired results is to lay out a plan and set a goal/s that incorporate all the facets of training such as weight, strength, cardio capacity, and overall fitness. You might even add things like flexibility and range of motion of certain joints if these are areas of weakness. If you want to gain weight, set a goal that involves eating high-calorie meals more frequently coupled with lifting heavy in the gym. If your goal is to lose weight, set aside time for a run or modify your approach to nutrition. We highly recommend a low-carb approach to the off-season, the benefits of which are detailed in Keto4Rugby. The common variable with both of these objectives is to set a goal. Now is not the time to get lazy and fail to put in the necessary work that is needed. “But I’m on vacation; I don’t have the time or feel like doing extra work during the offseason.” Don’t set yourself up for failure. Setting a goal is just the first step in getting the results that you desire. To increase your chance of adhering to your goal, keep a journal or track your progress, weight, nutrition, etc. There is a wide selection of health apps that are available for your computer, mobile device, or available to print off the Internet. The Ruck Science team are big fans of the Runtastic suite of apps since we encourage players to use low-impact training methods including road cycling to establish a cardio base. There is also a large number of electronic fitness trackers such at the FitBit that will track vitals such as heart rate, calories burned, and steps – the Up4 band is also a great choice if you’re keen to see what’s happening with your sleeping patterns. Taking advantage and making use of the various fitness technologies available can make setting a goal and seeing it through that much easier. Keep in mind that whether your goal is to gain or to lose weight, taking a few moments to identify any obstacles to your goal can help you avoid the obvious pitfalls that can set you back. There is no shortage of good food around the table during the holiday season. Follow any Prop into the kitchen and you will surely find a cornucopia of delicacies that will help you pack on a few pounds( if that’s your goal). “An added benefit of holiday foods are the increased calories that will (possibly) be consumed, said Pat Harrell. A Certified nurse at the Memphis Tennessee Trauma Center, President, and Flanker for the Jonesboro Chiefs RFC. “The holidays can be primetime when wanting to add muscle mass and strength.” “It takes a lot of calories to build size and by being selective with the right calories you can gain good lean mass,” said Harrell. Plan your active and recovery days around your holiday schedule to make the most of the downtime. If you know you’re going to be traveling near a park with a running trail, take advantage of the facilities and squeeze a run in. Does your hotel have a pool? Take a swim. Free weights at the apartment complex gym? Get a quick lift in, but don’t overdo it. You don’t have to perform your whole workout routine but don’t let prime opportunities go to waste. After Thanksgiving, holiday shopping will really pick up and you often find yourself walking the halls and aisles of a shopping center as you browse for gifts for family and friends. Take advantage of this extra activity and use it to your advantage. Just be careful and don’t offset what benefits you gain by bingeing at the mall food court. With cheat meals not too far in the future, we all know the holidays are a time for celebration, a time when we gather with friends and family to eat, drink, and be merry. Besides what’s the holidays without mulled wine, or grandma’s famous eggnog? That brings up the issue of alcohol consumption and the impact it will have on your workout routine, or any goals that you have set. How much is too much? Is a little a lot? Coughlin tackles this topic and gives some advice on the issue. “I think most people who do drink will drink around the holidays. Everything in moderation. Alcohol consumption leads to a lot more calorie consumption than people often realize. Mixers, chasers, drunken snacking and eating… It all adds up. Then there are the after effects that possibly lead to poor performance in the gym such as dehydration, low energy levels, lack of focus and decreased protein synthesis.” Coughlin cites the graphic below to better explain the calorie properties of various alcoholic drinks. Remember that alcohol has plenty of calories. Here’s a full list of how many calories are contained in any given drink. If you do decide to consume alcohol as part of your holiday celebrations remember everything in moderation. Excessive alcohol consumption can not only lead to you falling short of your goals but may hinder any attempts you make to progress your fitness plans. Setting goals and laying out a plan to achieve them is not the only proactive step you can take when gathering around the table in the next coming months. Taking a mental survey of what the chef has prepared and understanding the benefits individual dishes can add to your nutrition plan can make your goal that much easier to reach. In response to the question of what holiday food can aid an athlete in losing or gaining weight, Harrell shares his personal approach to dining. “Protein, Protein, Protein! There is an abundance of meats around at this time (of the year) and is perfect to help build muscle. Picking slow digesting/low glycemic index foods are what I look for. I actually will bring sweet potatoes and wheat bread to the party. Many times it’s not the foods but what’s in the food and how much we consume.” Make sure that if you chose to consume a significant amount of calories make sure they are quality calories and in the right portions that align with goals. Set a goal and keep track of your milestones as the holidays progress. Keep track of your goals with one of the many fitness trackers such as MyMacro+ and My Fitness Pal. Having a digital fitness tracker like a Fitbit can enable you to actually study your fitness data in a friendly format that can be exported. Take advantage of the amenities that you at your disposal such as local gyms, walking trails, and swimming pools. Kill two birds with one stone while your shopping by taking an extra lap around the mall while you shop for gifts. Stay away from the food court if you can and pack a healthy snack rich in protein to kill the shopping hunger cravings. If you decide to consume alcohol do so in moderation, take a second to weigh the pro and cons and decide whether or not having that extra mug of eggnog is worth it. If you’re not seeing the results that you desire, remember stick to it. Your overall health and fitness will thank you when you’re running laps and breeze through burpees on the practice pitch. Another tip to keep in mind is to KEEP IT SIMPLE! Don’t overdo it, but don’t slack either. A slight modification of your traditional workout routine will suffice to keep you sharp and in shape for whatever may come your way. Setting goals and adhering to these tips and tricks can see you through the holidays and make sure that you can enjoy a fun and fitness friendly holiday season with friends and family.